You and your friends are living pleasant and full lives in Happyville. You are highly trained and well-paid sous-chefs, who have decided to climb to the top of a tall building, as fast as you can. And he's pretty sure that knocking you off the building will help him get one. Perhaps he is right. Perhaps he is not. 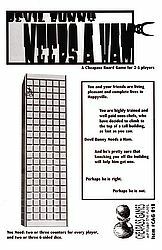 This is a board game with a fairly simple premise: you are racing to climb a tall building. Players use teams of climbers (2 or 3, depending on the variant you choose) to scale the building while the capricious Devil Bunny tries to knock them off. Move strategically and you might not fall to your death.